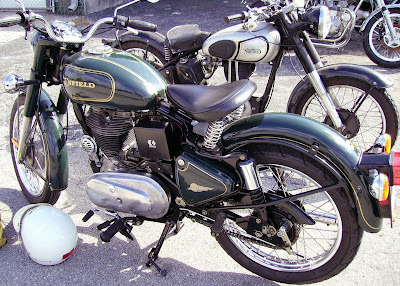 I'll get around to Royal Enfield motorcycles in just a moment. But first, consider the creatures of the field. Each day, as spring approached, they must have noticed that human beings slept a bit later and started a little slower. To the birds and even the cats and dogs of our suburbs, the day starts with the dawn, not with the chime of an alarm clock. How blissfully peaceful it must have seemed for them, waking to a sunny silence unbroken by the clatter of human activity. Each day the humans seemed to sleep a bit longer. And then, all at once, Sunday morning and especially this Monday morning, the humans, almost all of them here in the United States, jerked into wakefulness a full hour earlier, with the sun still below the horizon. The roar of traffic and, yes, the throb of motorcycles pierced the dawn. Do you think they wonder how we do it? To them, birds navigating thousands of miles across oceans is unremarkable. But the ability of all human beings to arise at the same moment, and to change that moment universally by an entire hour on the same morning must seem incredible. The truth is, we too wonder why we do it, when the alarm sounds an hour earlier on Monday morning. I am unemployed, with no time clock to punch, but, thankfully, my spouse still has a job. I get up to show moral support and make the coffee. Like many of you, I motorcycle, bicycle, hike and canoe to get closer to the natural world. Riding a Royal Enfield motorcycle lets me slow down the march of time to a pace more suited to appreciation. But it is hard to appreciate having to startle myself awake an hour earlier for Daylight Savings Time. Oh, but it means more daylight to ride! I had a beautiful, 45 min. ride into work today with 65 degrees under blue, Carolina skies. Hearing the sound of my Bullet rumble to life this morning made me wish my commute was more like 3 hours. These days, are motorcycling days, with a break in the middle for brief, 8 hour stop at the office. Chris, I envy you. You are a lucky man. im looking to buy a 2000 bullet deluxe 500 military.....any thoughts?